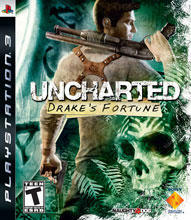 Uncharted: Drake's Fortune combines the best aspects of action/adventure games with the polish found in major motion pictures. Take Indiana Jones and put it into a third-person action-adventure game and you have The Adventures of Nathan Drake...err...Uncharted: Drake's Fortune, brought to you by the minds behind Crash Bandicoot and Jak & Daxter. You play as Nathan Drake, an ancestor of Sir Francis Drake, in search of the hidden city of El Dorado in search of gold and treasure. Along with a video journalist Elena Fisher and old friend Sully, Drake embarks on an adventure that takes the player through the jungle as well as underground caverns. Drake encounters old enemies throughout the game as well as other enemies which are a surprise and I won't spoil here. The entire game feels a lot like an Indiana Jones movie (especially the most recent Kingdom of the Crystal Skull). It's a great story from beginning to end and has the pace of a cinematic film. Most gamers should not be disappointed. Uncharted plays very similar to Tomb Raider as well as other third-person action/adventure titles. As Nathan Drake, you have the ability to run, jump, duck, and climb all over the place. You literally will be platforming throughout the game, but also ledge jumping over buildings and structures. Fortunately, Drake is pretty smart about his jumping and usually will move smoothly from one ledge to the next, rarely falling to his doom. The pace of the game is meant to be kept moving and Naughty Dog insured the pace will be kept by making platforming fairly fluid. When Drake isn't moving from Point A to Point B, he'll be dueling his way there through hoards of enemies. Enemy AI is spot on and has a little variety. Some enemies will creep and take cover around corners and pillars, firing their pistols when they have an opening. Others will rush at you with powerful shotguns that can usually take Drake out in a hit or two. Some will lob grenades in order to flush you out, and boy, does it work. Lastly, there are even snipers with laser site that'll instantly kill you if you stand around in the open too long. There is a decent selection of weapons, but it all comes down to your basics. You'll be utilizing a pistol most of the time, but there is also a shotgun, assault rifle, sniper rifle, grenades, and varying types of each. However, you can only carry one smaller firearm (such as a pistol or uzi) and one bigger firearm (sniper rifle or assault rifle) at the same time. Knowing which to keep at what time becomes important. Learning to use cover will keep players alive during huge gunfights where waves of enemies come at the player. The system works well as it lets players pop out, fire a few rounds, and return to cover. Near the end of the game, a new type of enemy shows up which I won't spoil, but everything about taking cover becomes irrelevant. There is only one boss battle in the game, and it's a bit annoying for a player who is on the verge of finishing the experience, but once completed, will leave players satisfied. The entire Uncharted experience begins with an introductory cutscene (all cutscenes using the in-game engine), coupled with platforming and gunfighting gameplay, along with more cutscenes. The pace of the game is that of a movie, moving quick at times and slow at others. However, from beginning to end, the pace feels perfect. Any gamer who enjoys third-person action/adventure games should have a great experience working through Drake's Fortune. The game looks like a next-generation title. Characters move realistically and the environments look lively. Some of the textures pop in and out and are blurry up close, but that may be due to the fact I was playing this on a standard definition television. Overall, the game looks great. The score seemed like it was ripped right out of the motion picture. Depending on the situation, the music changes. When alone in the jungle, it's peaceful. However, during a certain chase sequence, the music increases its intensity, matching the action that is on screen. With a brilliant voice cast, the game really becomes an interactive movie. The combination of characters, voice acting, score, and sound all form a fantastic experience that rivals most major motion pictures. With an easy to navigate menu and engaging gameplay, this is a game that gamers will want to play from beginning to end. Sadly, Uncharted suffers from short gameplay. Taking no more than around 7-9 hours to complete, the only other thing to do is collect 60 or so treasures that are located throughout the game. However, gamers should be satisfied with their first play through experience. There are a total of four difficulty levels, but it'll be tough to get gamers to play through the game more than once or twice. There are medals for certain achievements and earning more medals will unlock bonuses such as costumes and gameplay perks. Luckily, Naughty Dog is already planning a sequel.